German residents are subject to German inheritance tax. Always! Many of our blogposts deal with German probate and the tax implications of international inheritance cases (see list below). English solicitors and their clients are often stunned by the fact that German assets which are part of an English estate can trigger significant German inheritance and/or gift tax, in addition to UK IHT. Vice versa, if a beneficiary happens to be resident in Germany (even if Germany is not the main place of residence), that person’s share in the estate is also subject to German gift and/or inheritance tax. Therefore, German inheritance tax is closer than a British solicitor may think. 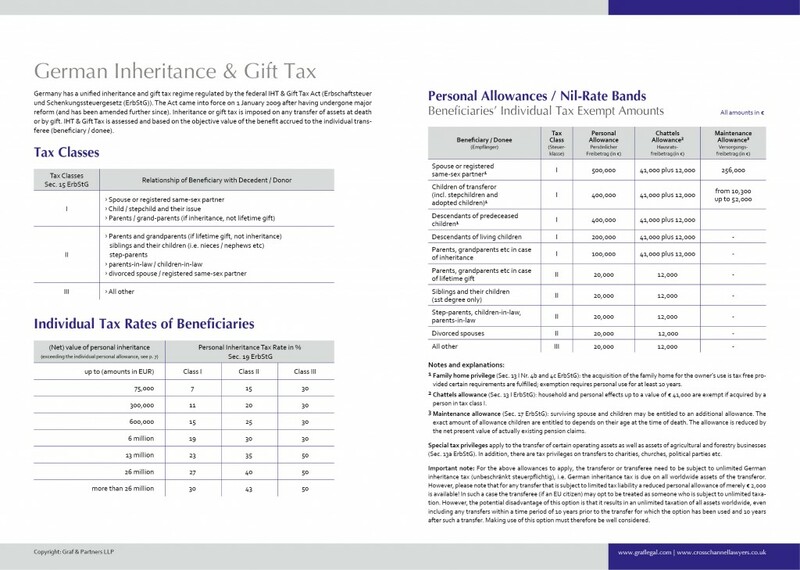 The below schedule shows at one glance the German IHT tax categories (tax classes), the individual tax rates and the various personal allowances and special tax exemptions available for certain assets. As you can see, the German inheritance tax system is much more complicated compared to British IHT. Depending on who the beneficiary is, the tax actually due can be significantly lower or higher than in the UK.